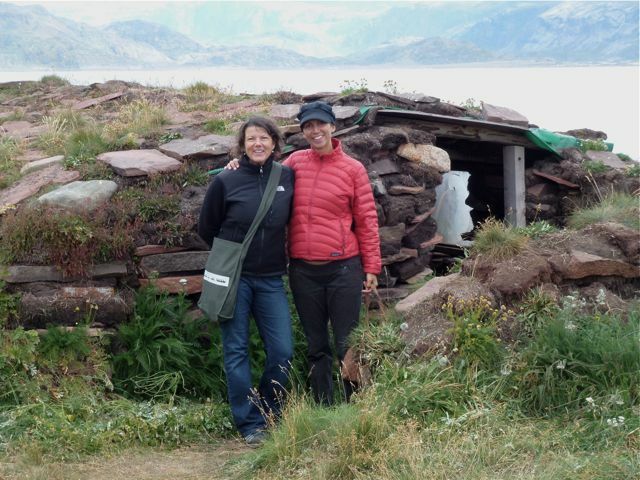 I am working with Prof. Lenore Grenoble, linguist from University of Chicago and IGERT’s Director of the Nuuk seminar, to document knowledge of plant uses and names across Greenland. 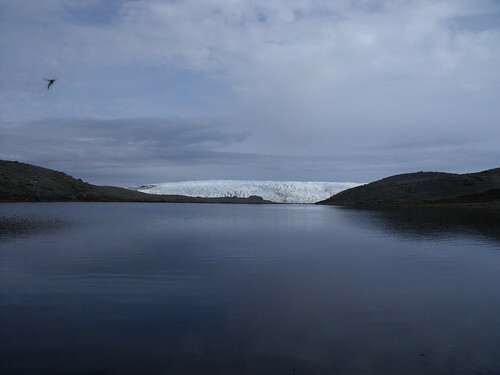 During our preliminary work last year in Nuuk, it was recommended that we visit southern Greenland, where milder climate contributes to greater vegetation and plant diversity. This year we will travel below the Arctic Circle to the southern most region of Greenland, known for it’s greenness and beauty. It was here that the Norse settled 1000 years ago. 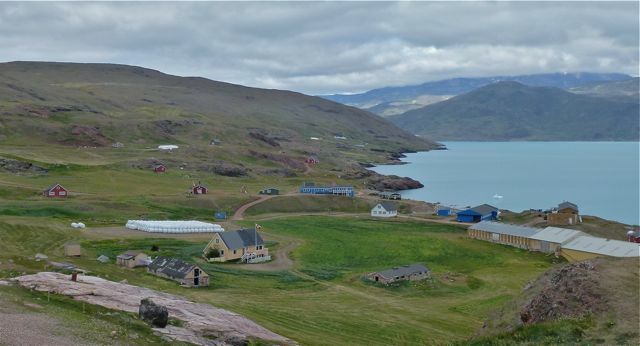 By propeller plane from Nuuk to Narsarsuaq, by motor boat 14 kilometers westward across Tunulliarfik (Eirik’s Fjord), Lenore and I travelled to Qassiarsuk, a sheep farming settlement of 60 people. Sheep herding was introduced to the area in the 1920s by Otto Frederiksen, and many of the towns people are his descendents. We had the pleasure of staying in the home of Laura Frederiksen, an elder in the community who was patient with my single-word attempts at Greenlandic and our many questions about plants. Laura's house. 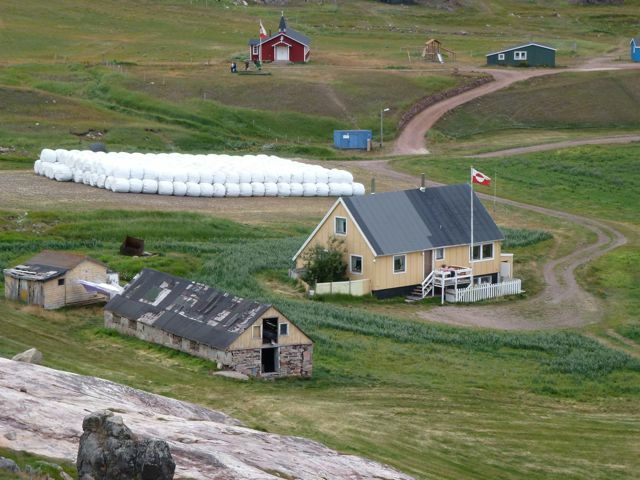 Note the stone sheep barn in the foreground and hay bales in the back ground. The red building is the church, and the green building is the dormitory for 6 children who come from even smaller settlements for elementary and middle school. 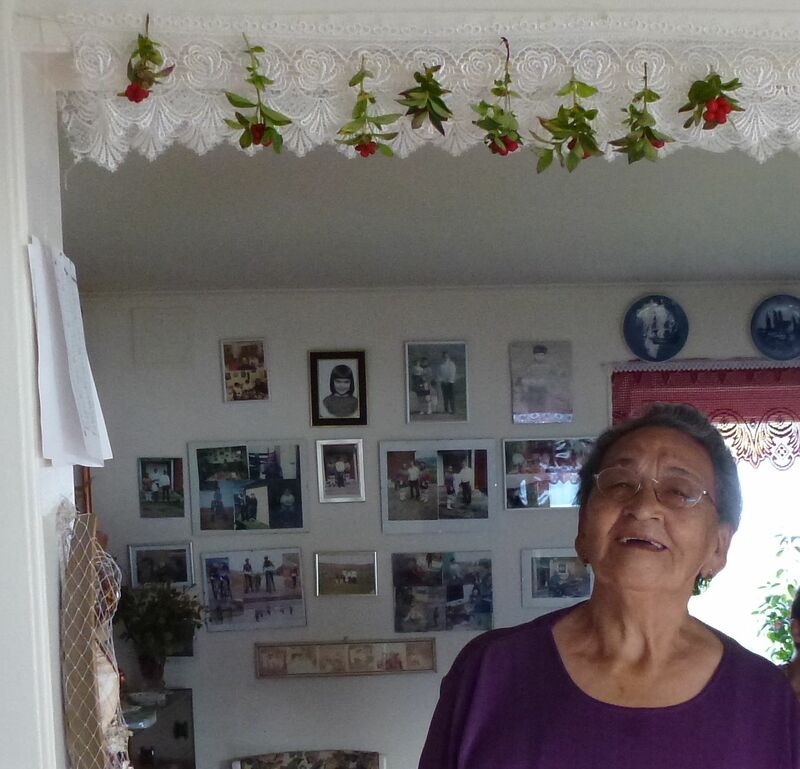 Our hostess beams at our excitement about her 'kimmernasaat' garland pictured above her head. (See below for another use of this plant). The trip was a great success! Besides Laura we interviewed her teenage granddaughter, her daughter-in-law, and three teachers from the local elementary school. A highlight was being invited to teach at the local school. Lenore worked with 6th-8th graders on conversational English, while I taught the 3rd-5th graders (a class of 5 children, the entire school has 26 students, 1st-8th grade). 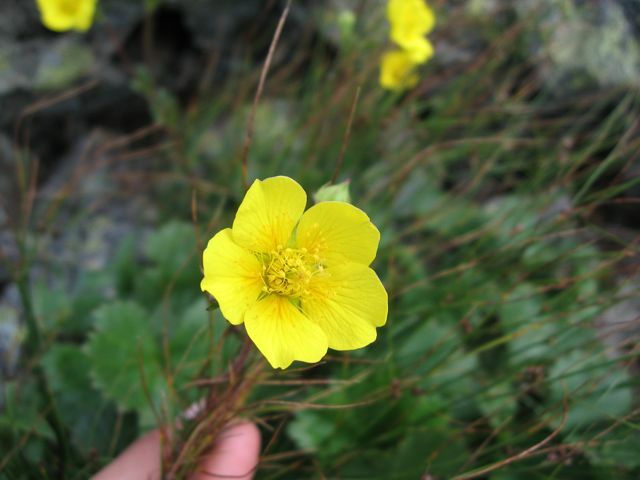 They are each making an illustrated dictionary of Greenlandic plants and animals in English. 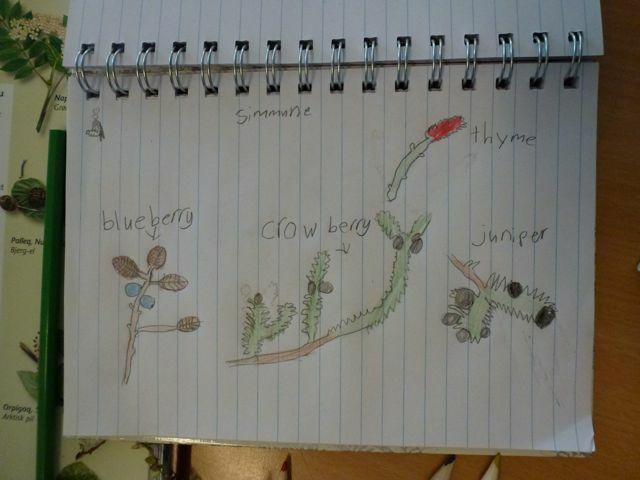 I taught them English names for some of their favorite plants (anything with edible berries!). Excerpt from a fourth grader's dictionary. Many of the plant uses we learned about during our interviews are culinary. At breakfast one morning we enjoyed a unique homemade preserve made of ‘kimmernaasat.’ A beautiful deep red color similar to cranberry sauce, it was very sweet and had small, crunchy chunks in it that reminded me of pomegranate seeds. 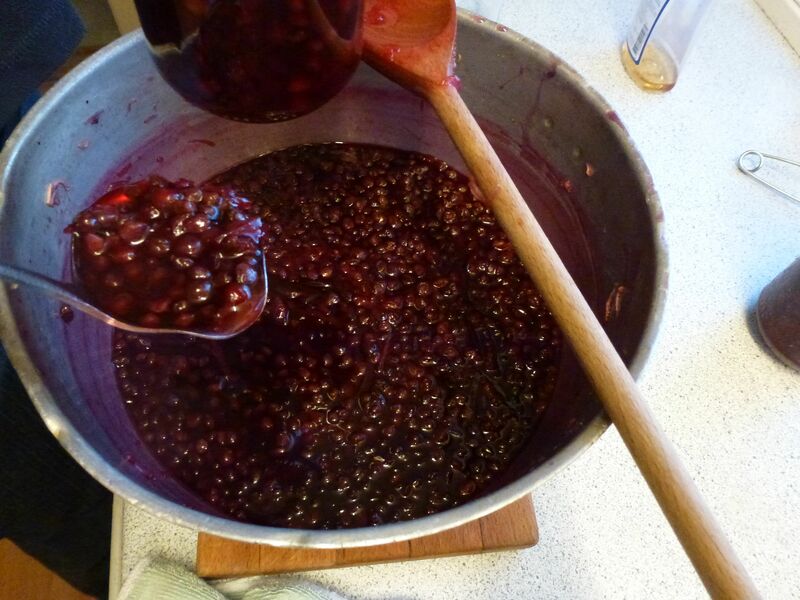 Laura taught us how to make this delicious treat from Cornus suecica, a member of the dogwood family. Plants are also often used decoratively. Laura had fresh and dried arrangements throughout the house and changed them often. She also made this wreath of native plants and roses she grew indoors to bring to a friend’s funeral. 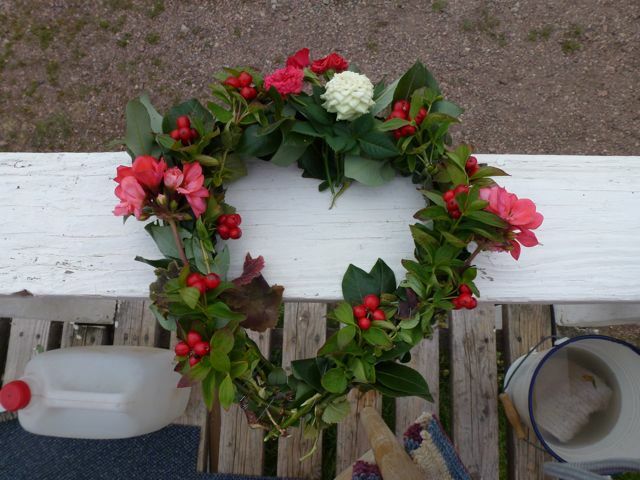 Laura's handmade heart-shaped wreath. The red berries are kimmernaasat, the roses and begonias were grown indoors. 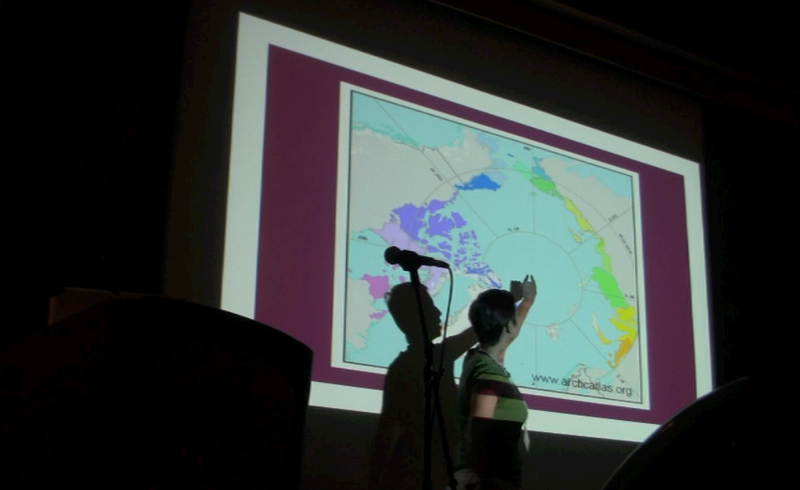 We are now further south in Nanortalik to continue our interviews. Check back soon for an update on our research! 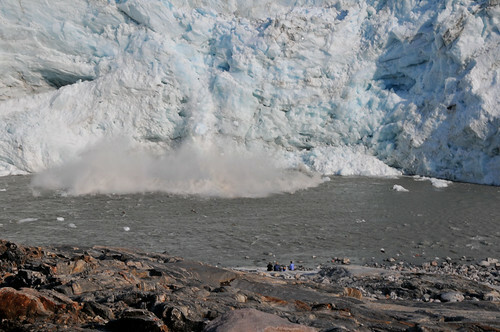 Inuugujaq from Kangerlussuaq, Greenland! We arrived yesterday afternoon after smooth travels thanks to the 109th Air National Guard. This is the third year in a row I’ve been to Kangerlussuaq and I feel incredibly grateful to be here. 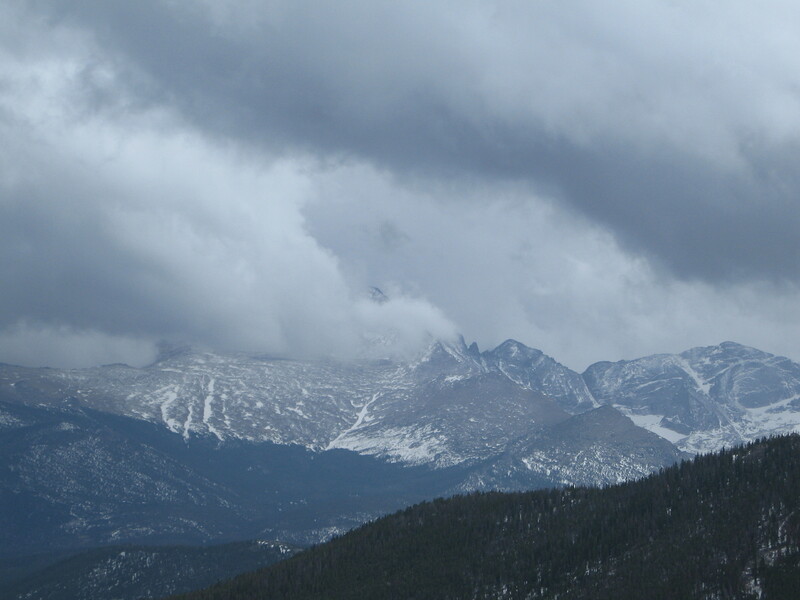 This is the earliest in the season that I’ve been here and the biggest difference (besides the presences of mosquitoes!) 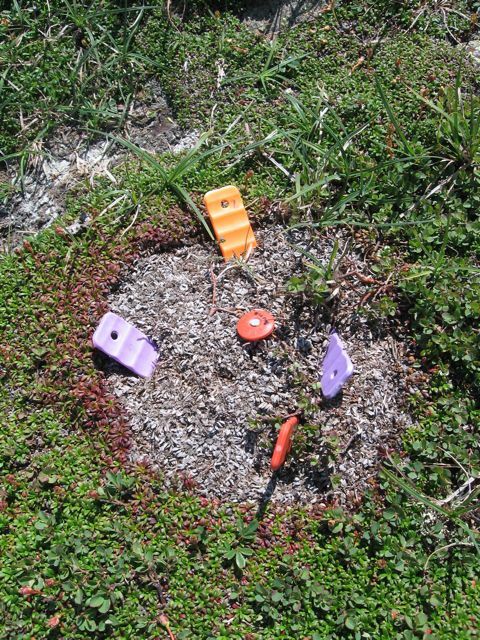 is that many of the tundra plants are flowering! 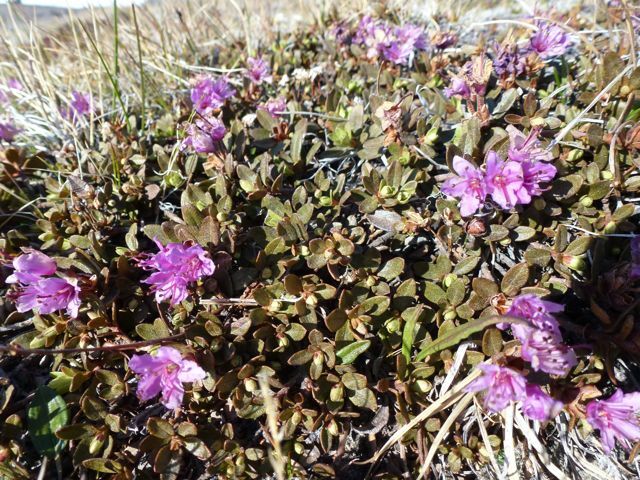 During the past two trips to the region, I learned how to identify many of the tundra plants from Simone Whitecloud, IGERT fellow and botanist extraordinaire. Today I put on my interdisciplinary “hat” and tried to remember everything she taught me! Below are some of the beautiful flowers I saw today. Rhododendron lapponicum. 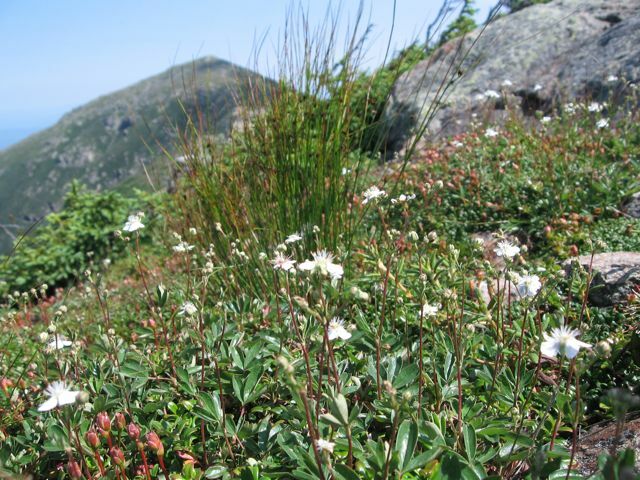 Much smaller than rhododendrons found in New England! 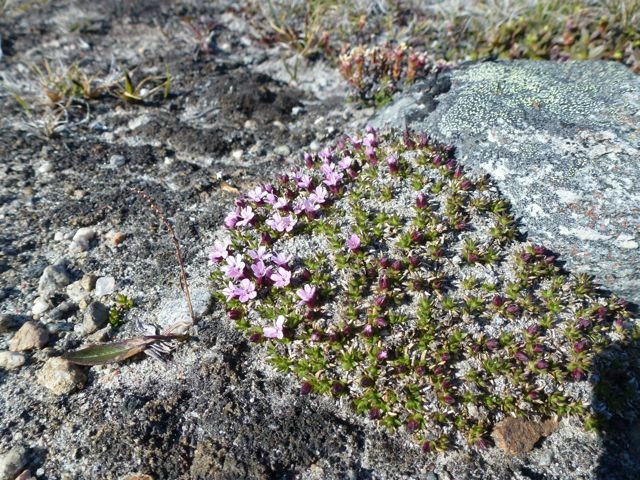 Moss campion. A tiny cushion plant! 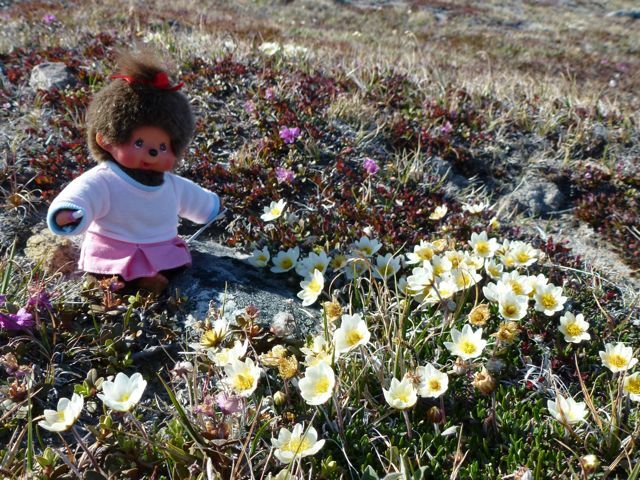 Monchhichi (for scale) amongst the Dryas octopetala. Stay tuned for more posts as our stay here continues!